We spent over 43 hours researching and testing 20 of the most popular ski goggles available and found that performance, anti-fog ability, and adjustability were most important. OutdoorMaster Ski and Snowboard Goggles scored high marks in all categories and is our top pick. These exceptional goggles are anti-fog, anti-wind, and offer 100% UV 400 protection on the slopes. The adjustable head strap is extra-long so it can be adjusted to fit many different head sizes. Your view won’t be compromised thanks to the frameless design of the goggles and they can fit over most regular glasses as well. Ski goggles are one of the most important pieces of ski equipment you can get. Goggles are critical to protect your eyes from the glare of the sun, and also protect them from wind and snow as well. It is very easy to get frostbite, wind burn and sun spots without the proper protection. Ski goggles work to protect your eyes by creating a wrap across your face that protects your eyes and face. There are tons of different styles of ski goggles on the market. Most skiers also want to find goggles that have style to them as well, so that is always a consideration along with finding the right protection and size. It is very important to choose the right goggles for the activities you do and the weather you will be out in. When choosing a pair of goggles, you want to consider many different features before you purchase a pair. Two of the basic and most important factors that are considered when looking at ski goggles are the slope conditions and the activity level of the buyer. You want to find models that offer FULL UV protection and that will be compatible with your other gear. The OutdoorMaster ski and snow goggles will provide skiers with maximum comfort and high visibility. The panoramic lenses give you a wide field of vision so your performance is not hampered. The magnetic lenses attach to the frame with 10 heavy duty magnets. All you have to is snap the lens on and off easily for cleaning or to change other lenses. These ski goggles come with an adjustable, elastic strap that won’t slip and assures the wearer maximum adjustability. The headband is easily swapped with others thanks to the snap on design. The dual side anti fog coating makes sure that the goggles won’t fog up and distort your vision on either side of the goggles. The OutdoorMaster ski goggles have excellent optical clarity and come with a 100% satisfaction guarantee. They come with a protective case, carrying pouch, a 6 month warranty and super friendly and helpful customer service. 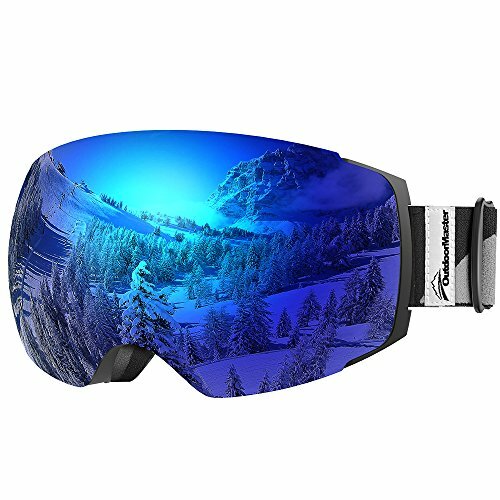 The high quality frames of these Yakaon ski and snowboard goggles is made from high quality flexible TPU material that is super durable as well. It has vented airways around the face to reduce fog from sweat evaporation. The breathable form is made up of 3 layers of memory foam that has strong impact resistance and provides and very comfortable wearing experience. It also keeps cold air and wind from penetrating and keeps your eyes warm as well. The stretchable strap can be replaced and the lenses are easily changed as well. These goggles perform well on cloudy days and at night also. The dual lens technology that is used gives wearers a wider range of vision and clarity too. There are no metal accessories, which are much safer overall and make them suitable for skiing, hiking, snowboarding, motorcycling and many more outdoor activities. 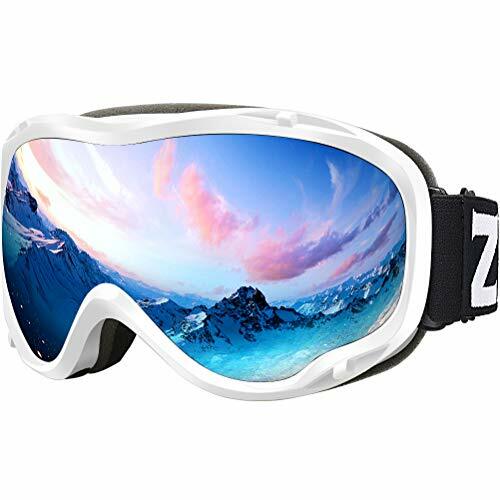 These snow and ski goggles fro, Zionor offers superior quality that has cutting edge design as well. The Backdraft series features dual lenses, anti-fog, anti-wind and 100% UV 400 protection whenever you are out of the slopes. The frameless design won’t block your view and offers terrific panoramic vision and a clear sight path all the way down the slopes. The magnetic and interchangeable lens system allows the lenses to be swapped out with no hassle at all. The head strap is adjustable and extra long and works well with many different sizes that will work for both sexes. There is ample ventilation at the top and bottom of the goggle and thick padding for maximum comfort. The vision through these goggles is distortion free so your performance will not be affected by not being able to see or see clearly. These goggles fit over most regular glasses. The outer lenses have a special scratch resistant coating that keeps vision free and clear. Ski goggles are very popular with people that spend a lot of time outdoors skiing, snowboarding and other outdoor activities as well. They are designed to provide the maximum amount of visibility and protection in harsher weather. The three top rated ski goggles featured above have everything a skier could want when it comes to great performance, protection and style too. All three offer UV protection and wide ranges of visibility so no matter what you’re doing, your view won’t be hampered. Read our buyer’s guide below to learn more about ski goggles and what to look for when you are searching for a pair to purchase. The information in this guide will educate you on the right frame sizes, lens tints and other important factors that come into play when you are comparing different goggles. The frame size that is right for you will depend on the size of your head and face. The style you want is also a consideration. Over the last few years, oversized frames have started to become more popular. There are several different sizes of frames to choose from. Remember to get some sizing information if you are not sure what size you wear. Small – Small goggles are narrow, shorter and shallower than other sizes. They are best suited for smaller faces, youth, children and skiers who are looking for a smaller design. You don’t want the goggles to be so small that they press into your skin uncomfortably, so watch getting a frame that is too small. Large – These frames have a very tall, wide and deep frame that works the best on larger faces. They are also good for skiers who want the oversized look. OTG Goggles – These goggles are deeper, taller and wider to accommodate regular prescription glasses underneath. Some OTG ski goggles have additional methods of preventing them from fogging up such as an electric fan. There are several factors that go into finding the right pair of ski goggles. When you take the time to take these into consideration and research the pairs that interest you, you will guarantee that you will not end up wasting your money on a pair that doesn’t meet your needs and is substandard in quality. The following points are the more common ones to look at. Fit – The foam should be the same across the whole front of the goggle without uncomfortable pressure spots. You don’t want any spaces for air to get in and dry your eyes out. Frames – You want to look at ski goggles that have frames that are flexible but still durable. Also look for vents where air can flow through the spaces in the goggles. This will keep the lenses from fogging up and obstructing vision. Lenses – You want dual lenses that are better at preventing fogging up. They also create a heat barrier that keeps you warmer. The spherical double lens models provide vision that is not obstructed by fog, wide panoramic views and super clarity as well. You also want to look for anti scratch lenses as well. Ski goggles have many different colored lenses. There are actually certain situations that each color is best suited for. We have provided that information below so you can think about the situations you will be using them and choose the color that works the best for your activities. Adding a mirror coating to the lens, regardless of the color won’t alter the color that you’re looking through. Lemon Yellow – Overcast days and stormy conditions are good for wearing yellow lenses because they brighten up everything and increase the contrast as well. Vermillion Pink – This color also increases contrast. Add silver mirror tinting to it and you have excellent goggles for many different weather conditions. Citrus Orange – These are great for sunny days. Adding a mirror tinting to them, the orange lenses work even better. Purple – If you are in lowlight conditions including, cloudy, overcast days or a snowy day, purple is a good choice because it brings out contours that can be hidden in some types of light. Photochromic – These change colors; a light pink and orange to a dark pink and orange and that depends on the weather conditions of the day. These changing color goggle lenses are very light and high-contrast to work well for rainy weather and are tinted enough to do well on the bright, sunny days. There are some features that are not standard with most goggles but sometimes they are offered. These extras make wearing the goggles even more comfortable and enjoyable. Scratch resistant – this will enable your goggles to last longer. Be sure to keep your goggles in a soft pouch or protective case to help minimize any potential damage. The scratch resistant coating will help this also. Photo shooting ability – Some new models of ski goggles offer the ability to shoot video and photos. This is a cool novelty that allows different perspective and a hands-free/hassle free way to take some excellent photos and video. GPS – You will be able to track everything listed below as you are doing it. This is great for those using skiing as a training/exercise method. Now that you have spent time and energy finding the perfect pair of ski goggles, you want to make sure that they last a long time. One of the things you should be looking for during your search is to make sure there is a warranty in place and that returns are not complicated or difficult to take care of if necessary. A company that stands behind its products will offer a warranty, plain and simple. Make sure the goggles you purchase are protected. Ski goggles are a necessity for any skier or snowboarder. Spending a lot of time skiing, out in the wind, cold and glare of the sun can make a mess of your skin and your eyesight. Sub reflecting off of the sun is blinding. The right ski goggles will protect your eyesight and your face as well from wind and cold. With all of the different styles, brand names and types on the market, finding the one that you will get the most use out of and that will meet your needs can be a daunting task without the right information. This buyer’s guide provides the right information that will enable you to make the right decision. The lenses are your most important feature and that is where a lot of your attention and time should be. 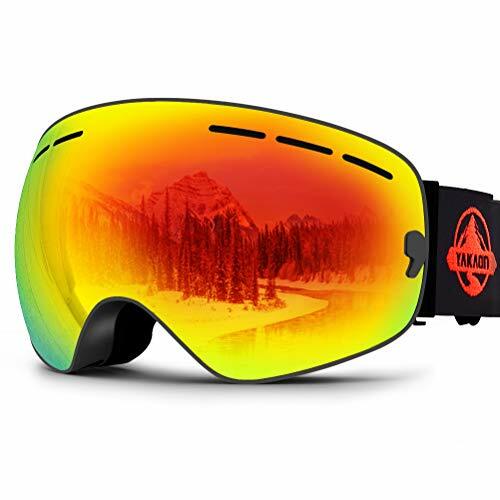 Ensuring that they have the necessary features you need to protect your eyes and face as well as provide clear, unobstructed views will make skiing and other snow-related and outdoor activities such as motorcycling and even boating much more enjoyable.